Today’s pet food aisles are a virtual Noah’s ark of different animal species. Mainstream pet foods now contain meats that would have been considered very exotic 5-10 years ago. Diets containing alligator, duck, rabbit, venison, bison, ostrich, brushtail, and kangaroo can now be purchased at a typical pet store. These diets are often marketed as being more “natural” for your pet, less likely to cause allergies, or just generally healthier than diets containing less expensive and exotic ingredients such as chicken, pork, or beef. Along with these promises typically comes a hefty price tag. So, what are you getting for your money? In most cases, just bragging rights to the most exotic pet food in your circle of friends. 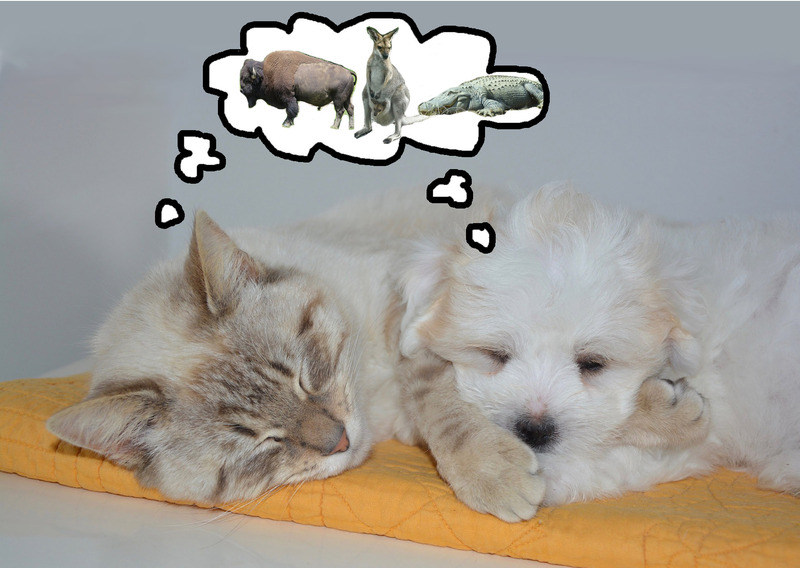 For healthy dog and cats, there is no benefit of including exotic proteins in pet food. They are not healthier than more traditional meats and consistent, high-quality sources of these proteins can be hard for companies to find, which can affect the quality and availability of the diet as well as the overall diet cost. As these animals are not raised on a large scale in the US for human consumption, many of them are imported from other countries in smaller batches. Many of the harvests of these meats may be seasonal, which can lead to big periods of unavailability if there are issues with one harvest. As an example, there is currently a global shortage of venison (most of which is raised in New Zealand), causing several veterinary therapeutic diets (for dogs and cats with suspected food allergies) using venison as well as numerous venison over-the-counter diets to be backordered for many months because the companies cannot purchase enough venison that meets their quality control standards to make the diets. In addition to potential shortages, the nutrient levels in these meats may be more variable with less available information than what is typically found in commodity meats such as chicken, turkey, beef, or pork. This means that pet food companies need to pay closer attention than usual to auditing their suppliers and testing ingredients and finished diets. Unfortunately, not all companies using these ingredients are up to this task. Another serious concern is that these exotic meats used to only have one role in pet food – they were used in pets with suspected or confirmed food allergies to more common ingredients. Food allergies in pets develop to ingredients that they are regularly exposed to – things in their everyday diet rather than to specific foods like peanuts or shellfish like in people. Food allergies, in general, are quite uncommon in pets – most gastrointestinal and skin signs attributed to food allergies are due to other factors in the diet (e.g. fat and fiber differences) or environmental allergies. But, for the pets that do have them, diagnosing food allergy and determining which food(s) the pet is allergic to is not an easy process. It often means feeding a diet that contains a very limited number of ingredients – 1 protein and 1 carbohydrate source that the pet has never before eaten (called “novel ingredients”). Until recently, it was unlikely that a pet would have been fed bison, venison, kangaroo, or duck and so these proteins were commonly used for these diet trials. However, now with the number of pets that are being fed diets that contain these ingredients, it is becoming harder and harder to find (or make) diets that contain novel ingredients to diagnose and treat food allergies. Feeding exotic proteins won’t prevent food allergies – they are no more or less allergenic than more common foods, they are just (at least until more recently) rarely found in pet food, so allergies to them are uncommon. Likely due to the cost of exotic proteins, most diets that contain them that you can buy at a local pet store also contain more common proteins and typically multiple protein and carbohydrate sources at that. An alligator and chicken diet has no benefits over a chicken diet when it comes to the potential development of food allergies and will then eliminate alligator as an option if the pet does develop an allergy on that diet. Even in over-the-counter exotic meat diets that do not have other proteins listed on the ingredient list, several studies have suggested high rates of contamination with common proteins, potentially from sharing machinery in a plant with more traditional foods. For this reason, over-the-counter exotic meat diets should never be used if you suspect your dog has a food allergy as they can complicate diagnosis and eliminate proteins that could otherwise have been useful for testing. Instead, you should work with your vet to do a strict diet trial with a veterinary therapeutic diet with fewer ingredients and more stringent attention to contamination with other proteins. We suggest ignoring the marketing and avoiding diets with exotic meats. In particular, do not switch between multiple diets containing different exotic meats. They aren’t helping your pet, but they are likely hurting your wallet! If you suspect that your pet may have a food allergy, talk to your vet about how to do an appropriate diet elimination trial and get their help choosing an appropriate veterinary therapeutic diet for that trial.